When Masdar City was first announced in 2007 by the Masdar Initiative, it claims that, when completed, it will become the world’s first zero carbon, zero waste development, while maintaining the highest quality of living. Foster + Partners and a team of environmental consultants including WSP and Transsolar have been appointed by Masdar to design the masterplan and the first stage of the project which broke ground in February 2008. Masdar City’s Master plan is claimed to “meet and exceed” the principals of One Planet Living (OPL), a set of ten guiding principles of sustainability, proposed in a joint initiative by WWF, the global conservation organization and Bioregional Development, whereby everyone lives within their fair share of the Earth’s resources. The principles include Zero Carbon, Zero Waste, Sustainable transport, Sustainable materials, Sustainable water, and Sustainable culture and heritage. The project also comes in the context of a rapidly increasing population and an economic boom in Abu Dhabi which -, together with new laws opening the emirate’s real estate to the free market- led to speculation and a housing shortage estimated in 2008 to between 35,000 and 50,000 dwelling units. This shortage has prompted the state to allocate billions for the construction of residential buildings, especially for foreign workers and western expatriates. This housing shortage has also resulted in rising house prices, which led to discussion of legislations that would introduce a 20 per cent quota for low-income housing in future developments. As planned, Masdar City is expected to be home to 50,000 people and to attract an additional 60,000 daily rail commuters to be employed in its planned 1,500 businesses. The project, which occupies a 6 square kilometers site, only half of which is to be occupied by structures, is expected to cost $22bn, which will be provided using a mix of governmental and private investment funding. Construction works are expected to reach completion by 2015. However, Masdar City does not seem to be about relieving the emirate’s housing needs or about providing low income housing in the face of rising housing costs. In fact, only 30 per cent of the city will be zoned for housing and all of the housing units, most of which are apartments, are to be sold -or let- privately and much of it would be to new residents. Masdar City seems to be more about drawing new investments, developing clean energy technologies in the emirate, encouraging technology transfer, and creating a new model for sustainable development. This explains why, in spite of the housing shortage in Abu Dhabi, Masdar is never disused as a housing project but as a development competing with other eco-city projects around the world such as the eco-city of Dongtan in China, which is trying to create the world’s first zero carbon city on an island at the mouth of the Yangtse river. Masdar City’s design also claims to be based on the fundamental principles of low-rise high-density residences, sustainable transportation, controlled growth, and balancing land for energy generation versus development in line with the principals of One Planet Living. Its designers claim that their designs are rooted in the tradition of walled Medinas, and to have used passive design strategies that were inspired by the traditional designs in the region. The city’s low-rise high-density compact design is to encourage energy efficiency and a better use of recycling systems. Its permeable north wall is to let in northern cool breezes, and its narrow pathways are to provide shade. Building materials with a high thermal mass will considerably reduce energy requirements, and its wind towers will be used for ventilation and cooling. The city’s design will allow it to use a quarter of the energy needed by a conventional city, to reduce waste production to a quarter and water demand to a third. 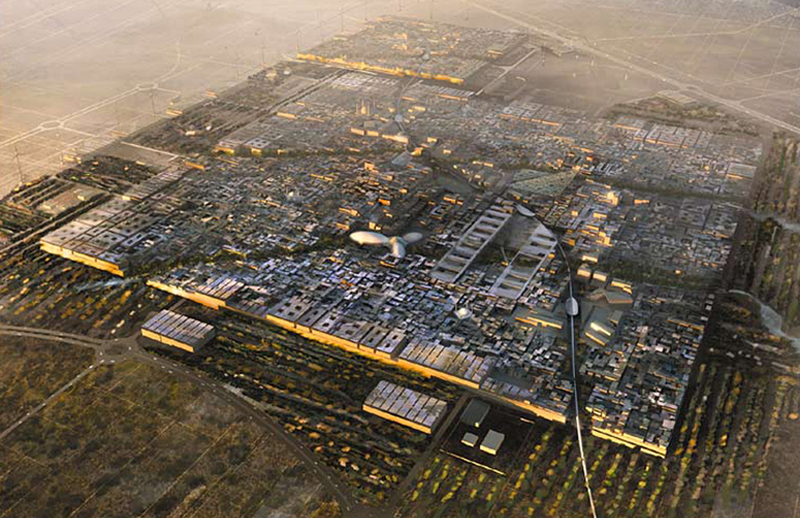 Masdar City, however, is by no means limited to its traditional strategies. In addition to its reduced energy needs, the remaining needs are to be generated on site. As a part of Masdar’s drive to develop new energy sources, the city’s design adopted a host of alternative and renewable energy sources. Masdar City’s stone-and-mud walls will be covered in photovoltaic panels, and its pathways would be draped with shades of fabric that convert sunlight into electricity. The city’s perimeter wall will form an intelligent outer shell, housing the energy, environmental and recycling services. Electricity is also to be provided using a mix of alternative and renewable solar power sources such as the largest grid-connected Photovoltaics plant in the Middle East. a giant solar thermal power plant, a large wind farm on the city’s outskirts, and a waste to energy power plant. All of which, as well as the solar powered water desalination plant, will occupy more than 10 per cent of the total site area. The solar plan is already being manufactured and installed to power the construction operations of the city. The city is also to have the world’s first Carbon Dioxide Capture and Storage plant and the world’s first hydrogen power plant. In addition, and in line with all the eco-city paradigms and literature that unanimously vilify the car, the compact high-density city is planned to be completely free of cars. Cycling and walking will be the most common means of travel, and are complemented by a personalized rapid transport system with a maximum walking distance of 200m to the nearest transport link or amenities. 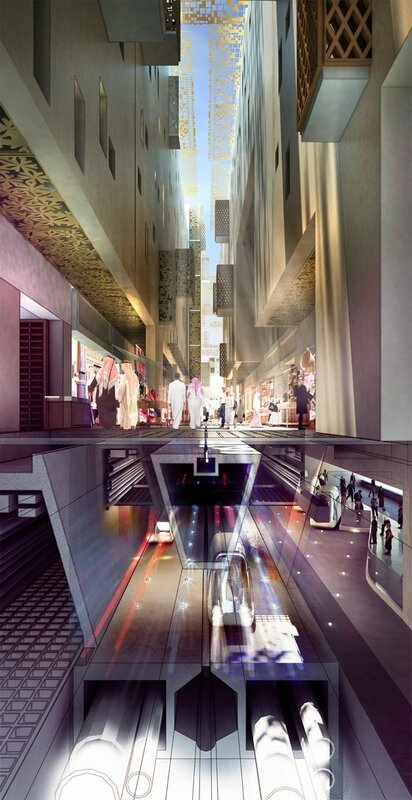 An underground Light Railway transport system will link Masdar to adjacent developments, the airport, and Abu Dhabi. The city designers have also planned mechanisms to deal with the highly saline ground water, and to capture fog and humidity for use as drinking water. They are also looking at measures to reduce or offset the carbon footprint of bringing food to the city from outside.While, the lack of a precedent to measure against, and the lack of local expertise in building low energy buildings in the region may pose a few challenges to the design team as it sets to design buildings that will achieve these ambitious goals, the progressive designs of the Masdar HQ building and Masdar’s City Center both appear to be in line with Masdar’s goals and presents an inspiration for the organic development of the city’s architecture. In appreciation to these efforts the International Renewable Energy Agency has decided to move its headquarters to Masdar. To discuss this article, please join Carboun’s vibrant discussion group on Linkedin. For news and updates on sustainability from around the region, join Carboun’s Facebook page or follow its Twitter feed.